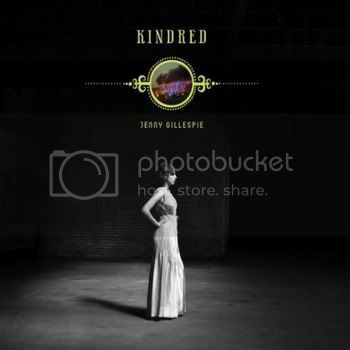 On Kindred, Jenny Gillespie achieves something rare. The songs have synthesizers and programmed sounds, and Gillespie’s piano and guitar parts are often processed, along with the drums when used. But there are also parts here for cello, clarinet, trumpet, and flute, and these sounds are left alone. The rare thing is that Gillespie and her producer Darwin Smith not only attempt this mix, but they make it work. The resulting music sound spare in some places, and lush in others, and it always serves the song, and the moment in the song. One remarkable example of how this works is the song In the Garden. Using a combination of synthesizers and processed sounds, Gillespie and Co set up a groove for her to sing over. It seems like the song will be that simple, and it sounds fine. But then, part way through, the listener realizes that there are hand claps in the mix. That wasn’t there before! Little details like this accumulate as the song progresses, and the arrangement at the end of the song is completely different from how it started. Now there are drums, electric guitar, and even synthesizer parts that weren’t there before. The important thing is that this not just for show; the affect is to increase the intensity of the song as it goes along, and this perfectly suits what is happening in the song emotionally. Things are usually not that straightforward though. Usually, the songs have subtle shifts in texture to achieve their emotional effects, but these shifts do not happen in a straight line. And the synthetic sounds do not always dominate the mix; sometimes the more traditional, or what I would call organic, instruments dominate the mix, while the synthetic sounds are added for flavor and texture. Over it all, Gillespie sings in a breathy high soprano, sometimes harmonizing or singing countermelodies with herself in overdubbed vocal parts. Breathy voices sometimes have a limited emotional range, but not so here. Gillespie carries the load of conveying the emotions of these songs beautifully, and the whole thing works for that reason. The lyrics are allusive, rather than direct. The combined effect of the musical arrangements and the lyrics gives the listener a template to use to fill in the details of what the songs are about. So my discussion of the lyrics may surprise Jenny Gillespie, and may not be what you hear in them either. Much is left to the listener, and this sort of thing must be done well, or it falls apart completely. It is done very well here. I am drawn most to the songs that feature the organic instruments, and I have chosen two of these to post. Swimming in Amber has an arrangement built around the acoustic guitar, and this is a breakup song. Gillespie’s vocal here conveys sorrow and loneliness, but also love remembered during the flashback sections. Merged Furs, on the other hand, takes place at the beginning of a relationship, and finds Gillespie determined to make this work, but also a bit anxious. Throughout, Gillespie’s words and her vocals present emotions as complicated; these are songs about adult relationships, not simple crushes. In Gillespie’s world, emotional states are often reflected in the world around her, so nature images abound. Secret Passageway has “a deer who’s nibbled on glass”, while Dance or Disappear has a tidal pool with rocks jutting from it as the tide goes out. It’s hardly surprising that the only song on Kindred that Jenny Gillespie did not write is called In the Garden. So each lyric is a poem to be pondered, with meanings that might well change as the reader goes through life. And the musical arrangements enhance this beautifully. I don’t think Gillespie could duplicate the sound of Kindred when she performs these songs live, but the songs are strong enough that I would still want hear them. And Gillespie displays a musical imagination that I’m sure would be up to the task.